Britain’s biggest supermarkets have been boosted with a £100million sales uplift thanks to Ramadan. Three million Muslims in the UK will break their fast with lavish sundown meals during the Islamic holy month, which began last Thursday and ends with the Eid celebration on July 18 this year. And this is welcomed by supermarkets, with retail consultants saying the religious festival is now the third most important to stores behind Christmas and Easter – with meat, rice and fruit the big sellers. Morrisons is expected to sell more than two million tons of rice, Sainsbury’s says rice sales are up at least 100 per cent year on year, while Tesco believes sales will jump by £30million during the month. Sainsbury’s world foods expert Hennah Baseer told MailOnline today: ‘Ramadan is becoming an increasingly important calendar date for us. ‘This year we’ve already seen an increase in customers buying Asian products from our stores. Sales are up on key ingredients that are used to cook meals during Ramadan. Meanwhile, Tesco runs Ramadan promotions in more than 300 stores in Britain, and said demand for key products including chapati flour, oil and dates rises by 70 per cent. A spokesman said: ‘Ramadan is an important time in the calendar for many of our customers and colleagues and sees friends and families gathering together around the dinner table. 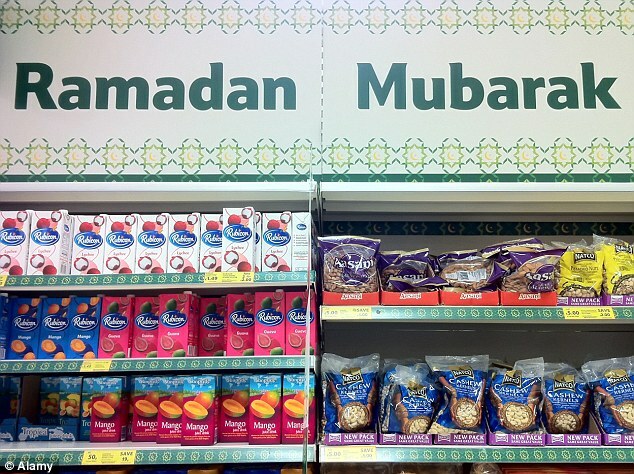 WHICH ITEMS ARE THE BIGGEST SELLERS FOR TESCO AT RAMADAN? Morrisons shifts 80,000 boxes of dates during Ramadan, while it also experiences a 40,000 per cent sales uplift on its 10kg Amira rice, which is sold at half price for the month. George Scott, of retail consultancy Conlumino, told The Times: ‘In terms of religious festivals, Ramadan is second now to Christmas and Easter in its importance to food retailers. The NHS warns that feasting during the pre-dawn and dusk meals can actually be unhealthy and cause Muslims to gain weight. It recommends food intake to be simple, and similar to a normal diet. This Ramadan is expected to bring the most challenging fast in decades because the holy month is coinciding with the Summer Solstice in the northern hemisphere for the first time in more than 30 years. The longer days mean the fasting period last Thursday stretched to almost 19 hours in Britain, compared to the Middle East where it lasted between 15 and 16 hours.